Extraordinary cost cutting (20–30 percent) is a challenging but necessary action when a business needs to severely course-correct (fix large strategy or execution errors) or during a downturn when costs rise faster than revenues and P&Ls quickly stop scaling. Leadership often chooses to execute one large cost cut verses a more gradual trimming over several quarters. Morale is the biggest reason cited to take cost out in one motion, so the organization can heal and move on. More gradual trimming can also lose steam versus the one fell swoop approach. For 20-plus percent cost cuts, Zero Based Budgeting (ZBB) is the weapon of choice. ZBB, as the name suggests, is when budgets are built up from zero as opposed to making incremental percentage reductions over the previous year’s actuals. The goal is to strip out all costs where the ROI cannot be cleanly justified, including some that might otherwise bypass scrutiny, such as existing multi-year vendor contracts. Internally facing service departments, namely HR, IT, and Finance, usually bear the lion’s share of cost cutting. Sales is usually spared, and Marketing, tied at the hip with sales, usually receives a much lighter sentence. Most ZBB exercises fail for one of two reasons. First, ZBB requires a different set of data compared to what’s readily available in the financial systems and general ledger (GL). Second, ZBB requires cross-departmental executive conversations and execution discipline, a process often lacking within corporations. It is impossible to achieve a 20-plus percent sustainable cost reduction unless departments are jointly working to reduce costs and make those cuts with precision. 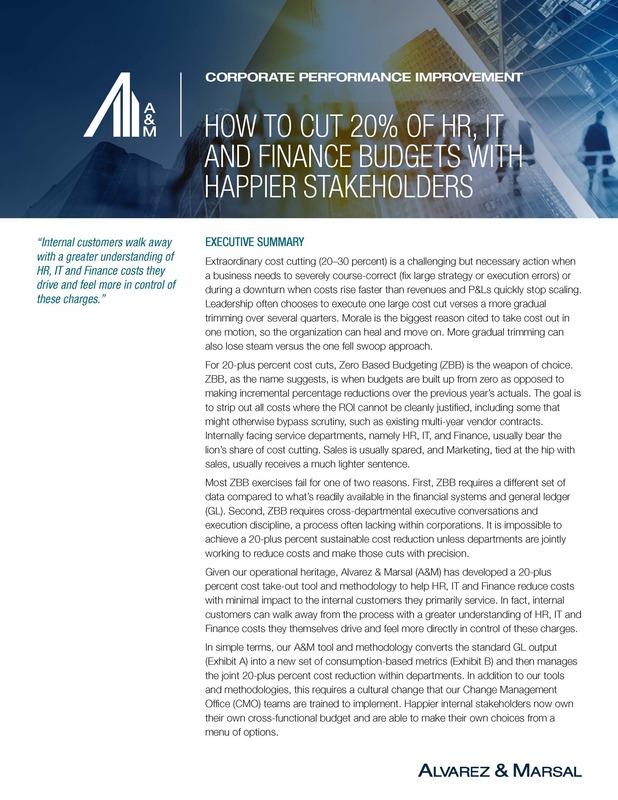 Given our operational heritage, Alvarez & Marsal (A&M) has developed a 20-plus percent cost take-out tool and methodology to help HR, IT and Finance reduce costs with minimal impact to the internal customers they primarily service. In fact, internal customers can walk away from the process with a greater understanding of HR, IT and Finance costs they themselves drive and feel more directly in control of these charges. In simple terms, our A&M tool and methodology converts the standard GL output into a new set of consumption-based metrics and then manages the joint 20-plus percent cost reduction within departments. In addition to our tools and methodologies, this requires a cultural change that our Change Management Office (CMO) teams are trained to implement. Happier internal stakeholders now own their own cross-functional budget and are able to make their own choices from a menu of options.